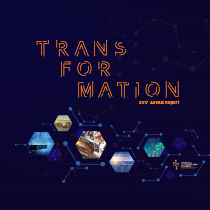 It is our pleasure to present the 2017 Arizona Technology Council Annual Report, chronicling last year’s achievements. Arizona definitely grabbed the headlines in early 2017 when autonomous cars headed this way after our own Gov. Doug Ducey offered the state’s roads for testing self-driving vehicles when California’s sea of regulations created too many barriers for this disruptive technology. Top 10 for the sector’s contribution to the state’s overall economy. Top 10 for actual tech occupational jobs among total tech industry jobs. Top 20 for total technology occupations across all other industries. Top 20 for percentage that average tech wages exceed average state wages. Between public policy successes, the recapitalization of the Angel Investment Tax Credit, and our members accomplishing incredible things, like Intel’s Fab 42 facility, World View’s testing of high-altitude balloons, and exciting developments by Uber and GM in the autonomous vehicle space, 2017 was certainly a momentous year for the Arizona technology community. View and download the full 2017 Annual Report here.